PIXAR AT OMSI — "The Science Behind Pixar," an exhibition about the science behind some of the most beloved animated films and their characters, is now open at the Oregon Museum of Science and Industry. This hands-on exhibition demonstrates the technology that supports the creativity and artistry of Pixar's storytellers. Created by Pixar Animation Studios and the Museum of Science, Boston and featuring more than 40 interactive elements, "The Science Behind Pixar" showcases the science, technology, engineering, art and math concepts used by the artists and computer scientists who help bring Pixar's award-winning films to the big screen. The exhibit runs through Sept. 3 at OMSI, 1945 S.E. Water Ave., Portland. Tickets to this exhibit, which include general museum admission, are $21 for adults, $14 for youth (ages 3 to 13), and $17 for seniors (ages 63 and up). Prices for OMSI members are $5 for adults, $3 for youth, and $4 for seniors. Guests can purchase tickets online at omsi.edu, via phone at 503-797-4000 or in person at the museum. OPEN HOUSE — Old College Hall at Pacific University hosts an open house 1 to 3:30 p.m. Wednesday, April 3. Old College Hall was built in 1850 as Pacific's first university building. Today, it is one of the oldest educational buildings still in use west of the Mississippi River. The hall has been moved three times and now stands on the southwest corner of the Forest Grove Campus. The cupola, or bell tower, has become a symbol of the university's history, and the old bell still rings to commemorate special events. Students ring the bell one by one at the beginning of their academic careers, and again upon graduation. The museum features a collection of artifacts from the history of the school and the Forest Grove region. 2021 College Way, Forest Grove. Free. 503-352-3096. LU'AU — Pacific University's annual Lu'au is 4:30 p.m. Saturday, April 13. Hawaiian club Na Haumana O Hawai'i will present its 59th annual Luau with traditional Polynesian dance, music and entertainment, preceded by an authentic meal featuring traditional staples like kalua pig, chicken long rice, teriyaki chicken, poi, haupia, coconut cake and punch. 2043 College Way, Forest Grove. $20 to $42. Visit pacific.edu/luau or boxofficetickets.com. ART EXHIBIT — An exhibition of landscape paintings by Sheila Chugani Baumgardner, curated by Cultural Arts staff, is on display through the months of March and April in the Hillsboro Civic Center's Shirley Huffman Auditorium and adjacent gallery wall. The Civic Center is located at 150 E. Main St., and is open to the public Monday through Friday, 9 a.m. to 5 p.m. Baumgardner paints whimsical acrylic landscapes inspired by the urban parks of Portland and the natural wonders of Oregon, and reflective of her cultural heritage and upbringing. The series of paintings on exhibit invites viewers to imagine they are relaxing on a couch at home while being immersed in the joy and beauty of the Oregon landscape. Born in India, Baumgardner spent most of her formative years in Japan and now lives in Portland. She cites as an inspiration the work of American painter Thomas McKnight, known for pop-influenced interiors framing views of brightly hued landscapes, including scenes of Kobe, Japan. Baumgardner strives to imbue her work with cheer, and her work reflects the style and joy of the cultures and places that have influenced her along the way. SPRING BREAK — Valley Art presents Spring Art Break for Kids from 1 to 3 p.m. through Thursday, March 28. Wednesday is Free Create, and Thursday is Clay Day. Admission is $20 each, or $50 for all three classes. Space is limited. Closed-toe shoes are required. Recommended for ages 7 and older. Valley Art is located at 2022 Main St. in Forest Grove. Register online at artingales.org/calendar. For more information, visit valleyart.org/classes. NATIVE AMERICAN FLUTE — Pacific University presents R. Carlos Nakai, the world's premier Native American flute performer 7:30 p.m. Saturday, April 6. Nakai brings his award-winning music to the Pacific stage with percussionist Will Clipman at the Taylor-Meade Performing Arts Center, located at 2014 Cedar St. in Forest Grove. $22.50 to $25. Visit pacific.edu/performing arts, 503-352-2918. RHYTHMS — The Glenn & Viola Walters Cultural Arts Center at 527 E. Main St. in Hillsboro presents Neftali Rivera and Grupo Borikuas in concert at 7:30 p.m. April 19. Neftali Rivera and Grupo Borikuas capture the essence of Puerto Rican, Cuban and Afro-Caribbean rhythms. $12 to $16. Visit hillsboro-oregon.gov/walters,503-615-3485. OPEN MIC — Influence Music Hall at 135 S.E. Third Ave. in Hillsboro hosts its Friday open mic every Friday from 6:30 to 10:30 p.m. Music, poetry and comedy are welcomed. Visit influencemusichall.org or call 503-701-6859 for more information. MOZART — ISing Choir presents "A Little Night Music" at 7:30 p.m. Saturday, April 6, and 3 p.m. Sunday, April 7. The concert features the music of Mozart, and includes an art show of work by Laura M. Kemp. St. Matthew Lutheran Church, 10390 S.W. Canyon Road, Beaverton. Free. Visit isingchoir.org. JAZZ NITE — Pacific University presents Pacific University Spring Jazz Nite featuring the University Jazz Band at 7:30 p.m. April 26. Taylor-Meade Performing Arts Center, 2014 Cedar St., Forest Grove. $5-$7. 503-352-2918. TECH ASSISTANT — Need help with basic computer skills? Drop into the library for regular sessions with local tech assistants on Monday afternoons from 6 to 8 p.m., or call 503-259-0185 to reserve a spot. ANDEAN FOLK MUSIC — Aloha Community Library presents "Chayag," a concert of Andean folk music, at 11 a.m. April 27. Alex Llumiquinga of Chayag returns with his family to share the sounds and influences of Andean folk music through a variety of instruments, costuming and dance. 17455 S.W. Farmington Road, Suite 26A, Aloha. Free. Visit alohalibrary.org, 503-259-0185. Cornelius Public Library, 1370 N. Adair St. AUTHOR TALK — Investigative reporter and journalist John Dodge will speak at 6:30 p.m. Tuesday, April 2, in the Rogers Room about his recently published book "A Deadly Wind." The story tells the tale about the 1962 Columbus Day storm. Book signing to follow. Free to the public. PORTLAND OPERA — Hillsboro Brookwood Library presents Portland Opera Season Preview at 1 p.m. Sunday, March 31. Join members of the Portland Opera as they perform a set of featured songs from the upcoming season of shows. Free to attend. Hillsboro Brookwood Library, 2850 N.E. Brookwood Parkway, Hillsboro. Visit Hillsboro-Oregon.gov/Library for more information. BOOKS BABIES STORYTIME — Each Wednesday at 10 a.m., meet for stories, songs, rhymes and finger-plays with volunteer Lauren for babies up to 12 months. Come meet other families with little ones and introduce baby to early literacy activities. For more information, call 503-647-5051. SING OUT — Broadway Rose Theatre Company presents "Rodger & Hammerstein's A Grand Night for Singing," from Thursday, March 28, through April 28. Thursday through Saturday shows start at 7:30 p.m.; Saturday and Sunday shows start at 2 p.m. Many of the most beloved, uplifting, and romantic songs in musical theatre history have one thing in common: the incomparable writing team of Richard Rodgers and Oscar Hammerstein II. "A Grand Night for Singing" collects over 30 treasured hits from Rodgers and Hammerstein shows such as "Oklahoma!" "South Pacific," "The Sound of Music," "Carousel," "The King and I," and "Cinderella," and invites audiences to experience these classics anew through artful arrangements and clever interpretations. The venue is Broadway Rose New Stage, 12850 S.W. Grant Ave. in Tigard. $25-$48. Visit broadwayrose.org, 503-620-5262. HONK! — STAGES Performing Arts Youth Academy presents "HONK!" from April 19 through May 5. Friday and Saturday shows are at 7 p.m. and Sunday shows are at 2 p.m. There is no show on April 21. This award-winning adaptation of one of the world's most beloved fables, "The Ugly Duckling," is a heartwarming celebration of what makes each person special. The venue, HART Theatre, is located at 185 S.E. Washington St. in Hillsboro. $12-$15. Visit stagesyouth.org. SEASONAL BUGS — The Washington County Master Gardeners Association holds its presentation, "Seasonal Bugs and Beasties, at 6:50 p.m. Tuesday, April 2, at Beaverton's Griffith Park Building, Room 330, 4755 S.W. Griffith Drive. No registration needed and parking is free. Each season brings different bugs into our gardens and homes. Some of these are beneficial, at least in the garden, while others are problematic. In this presentation, Jean Natter describes some of the critters that greet us and offers suggestions for effective and appropriate responses. NATIVE PLANTS — From 10 to 11:30 a.m. Thursday, April 4, the WCGMA Learning Garden at Jenkins Estate, 8005 S.W. Grabhorn Road in Aloha, the Washington County Master Gardener Association holds its presentation, "Growing NW Native Plants" with speaker and master gardener Ardis Schroeder. Schroeder will answer such questions as, "What is the definition of a native plant?" and, "What specific Northwest native plants will grow well in my yard or garden?" Use the Camp Rivendale entrance, park and then walk past play structure down to the Learning Garden. No registration needed. Free parking. 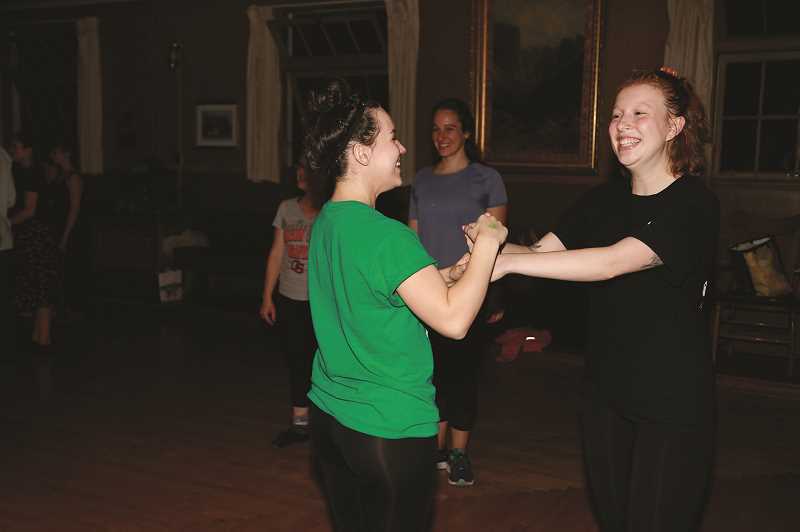 CEILI — S & A Irish Entertainment presents its First Friday Irish ceili with traditional song, live music and dance from 7:30 to 11 p.m. Friday, April 5, at Winona Grange, 8340 S.W. Seneca St., Tualatin. $10-$12. Visit irishpdx.com. OREGON BALLET THEATRE — Sherwood Center for the Arts' Family Matinee Series presents Oregon Ballet Theatre 2 (OBT2) at 2 p.m. April 13. Established in 2015, OBT2 is composed of talented young dancers chosen from top levels of the Oregon Ballet Theatre School. On the cusp of a professional career, these gifted dancers perform a gorgeously curated collection of excerpts from iconic classical and contemporary ballets. Join OBT2 as they perform a duet from "Rassemblement," by Nacho Duato; "Jewels" from the third act of "Sleeping Beauty;" "Ellington Suite" by Dennis Spaight; and a new piece by OBT Soloist Matthew Pawlicki- Sinclair. Doors open at 1:30 p.m. 22689 S.W. Pine St. Sherwood. $5. Visit sherwoodcenterforthearts.org, 503-625-4278. BOOK DAY — Tigard Public Library presents "Children's Day Book Day with Ballet Folklórico" at 2 p.m. April 28. Celebrate children, families and reading with crafts and a Ballet Folklórico performance. 13500 S.W. Hall Blvd., Tigard. Free. Visit tigard-or.gov/library.